There are some issues with certain watchdog dialog uses, rules, combinations of rules, and rule types. We are working on them now, after discovering inconsistencies and deciding the whole system needed a refit. The watchdog actions should be improving rapidly in the next few builds. Of course, there are other cases where the problems are the result of a misconfiguration, but either way I want things operational. Keep an eye out for improvements! + The first rule is to make sure you clicked 'run elevated' during installation. This is the cause of many failures. The second is to make sure you have sufficient access if operating on the processes of other users. + Note that 'Notify' type entries are just coming online in 6.0.1.55 beta. These may have previously malfunctioned all-together. + In other cases, operations on processes hosting services can cause a stall as the governor slowly tries to shut down or restart services of that process (whatever it was instructed to do). This is something we are evaluating. Status updated. I/O priority issue with watchdog dialog fixed. I will upload a new beta after I'm done with today's work on it. Fixed build now available (not 100% tested, still beta). Much more work remains on the entire subsystem. I want to make sure it is all 100%, as it should have been the last final. Everything was working fine (trial) before I purchased the full version. How do I fix it? It's really urgent. 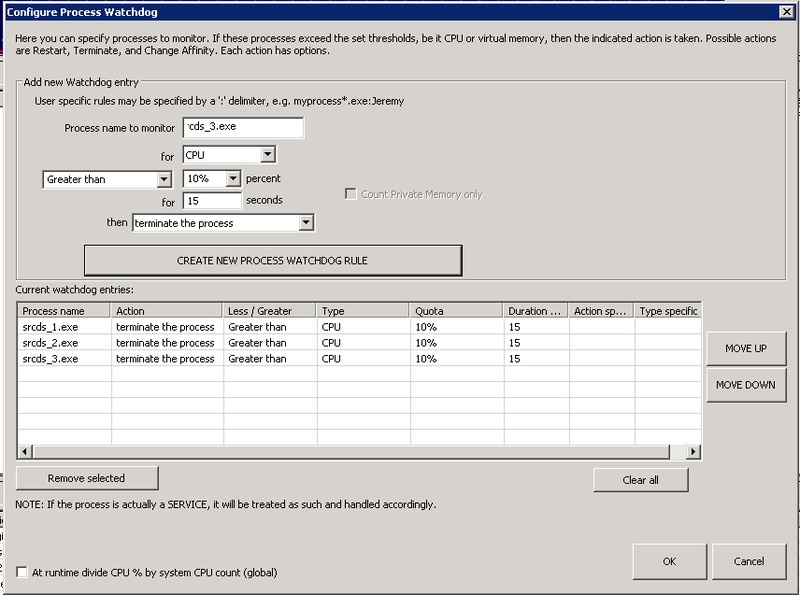 How do I download older versions of Process Lasso? I am currently working on the watchdog features in the beta series out now. I will evaluate these rules closer in my testing and make sure they are working. I've already refactored much of the code, but more remains. The dialog is what is most problematic really - not saving and/or restoring things as it should. With each beta this gets corrected. It shouldn't have shipped in this state, but the watchdog rules grew a bit organically, and thus needed a good refactor to accommodate the large addition of new rules. I apologize for any trouble and hope you will give me time to make sure this is fixed up. I will also be documenting the backing settings in the INI file, so that you may make manual edits if necessary. This topic has been merged, as the cause is the same - a malfunctional (or semi-functional) watchdog configuration dialog. I will report progress as it comes (and it will come rapidly). While working on this I determined that the cause was the GUI. 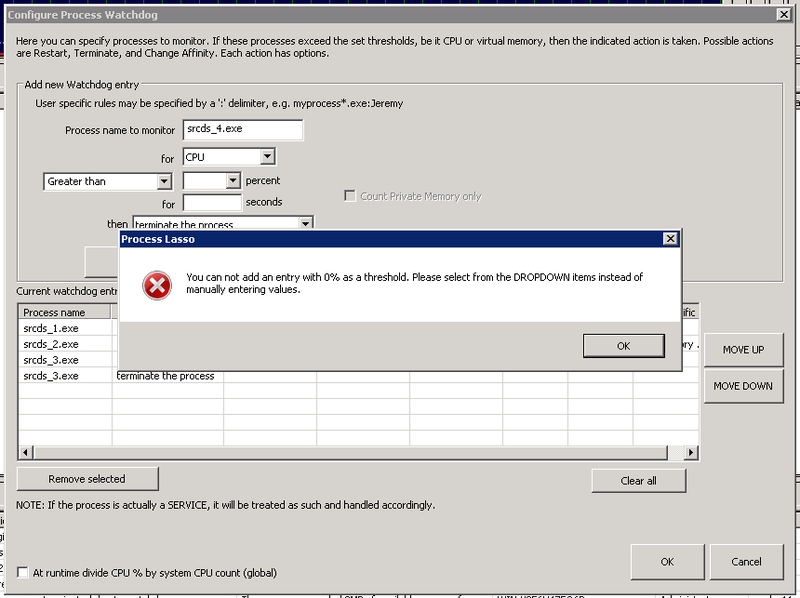 Therefore, it probably worked until the GUI saved the errantly shown values when you reloaded the configuration dialog. Before you purchased, you may have lost access to this configuration dialog, preventing it from being loaded wrong (and then saved wrong). I am issuing a proper fix in the next beta, but until then creation of a set of watchdog rules will work, so long as you don't open them back up for a second edit . Like I said, working on it now, and fixed in next beta. Also see documentation on the process watchdog rules INI entry. 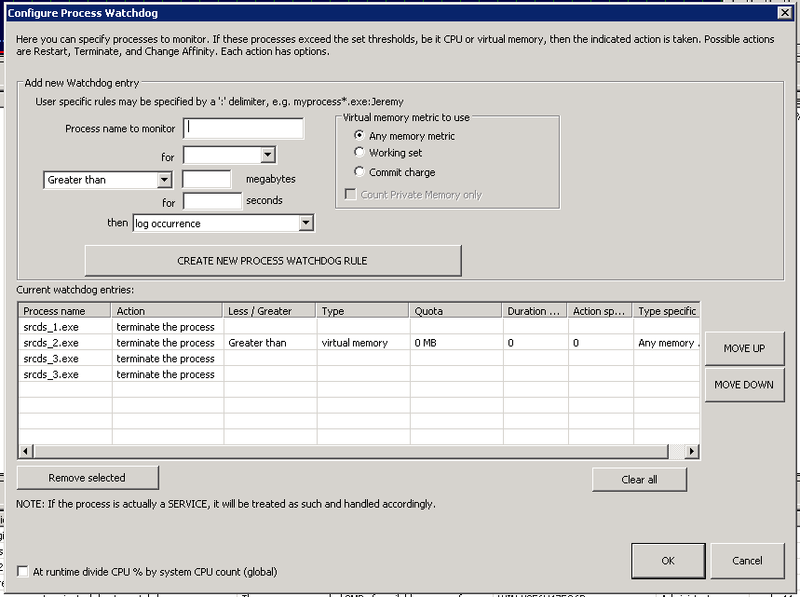 The Watchdog Configuration Dialog has been considerably cleaned up and fixed in v6.0.1.59. Part of it broke in an earlier build, and other parts were malfunctional to start with. I still have a ways to go, but this is a good leap forward and will resolve many existing watchdog issues, though not all. Another beta may come later today or tomorrow. This new v6.0.1.59 beta will be uploaded within about an hour of this post. Thank you for being so willing to fix the issue. I've reverted back to an (really) older version of Process Lasso I downloaded from 'My Bitsum' and it's working flawlessly. I'll be sure to update it as soon as you release the latest version (or is the version you released above the fix?). Yes, older versions worked great. This broke at some point due to small modifications to the dialog. I never noticed it because I rarely tested more than one rule at a time, and when I did, I didn't go back and edit them much. It is mostly a simple GUI flaw. It is a real shame. My regression testing I hope to improve, though I still rely on users to help with beta versions. The dialog is nearly complete again, and I'd encourage you to start trying the next beta on a non-mission critical system, if you have one. Just to make sure the final does indeed address *all* your concerns. Like I said, wait for .61 though, as there are still some more minor improvements I want to make.